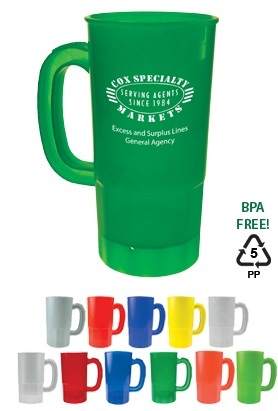 These 22 oz custom plastic steins are one of the most affordable and professional plastic drink steins available online. These steins are perfect for any sporting event, fund raiser, and wedding. All of our custom steins can be customized with your personalized printed information! Give us a call (706) 374-0710 for a FREE quote and to put our years of promotional and advertising experience to work for you. Contact us for additional color pricing. Multi-color personalized imprints only available on one side.